I guess you have seen variations of these in my site as this Squash and String beans in Coconut Cream sauce is a popular base for different types of meat in the Philippines specially seafood such as Shrimps and Crabs. Also if you have noticed most of the Philippine dishes originated on different bases like Sinigang, Adobo and Afritada to name some, and from these base different meats is used to create a different dish. This now shows how Filipino dishes are flexible in terms of ingredients used as we can swap different meats as well as the vegetables from the base dish; I guess it’s made that way because of how seasonal the vegetables can be. Making it in that way you can still enjoy the same meal even you don’t have the original ingredients. So for this dish we will be using the Squash and String Beans in Coconut Cream Sauce base and use shrimps instead, on my past posts we used the same base but used crabs and pork instead. If you like creamy dishes and you love seafood then this should be a must try. And don’t forget you need to use your hands when you eat this dish, thats why the shrimps shell is still in tact, and if you dont know how to use then here is a good guide to let you know. In a wok, heat up oil and sauté garlic, onion and chillies. Add butternut and string beans and stir fry until there is a little bit of browning on the butternut. Add coconut milk, bring to a boil and simmer for 5 minutes. Add shrimps and flavour with fish sauce. Simmer for additional 2 minutes. This sounds like a must make dish – I have never thought of pudding butternut with shrimps before. I am looking forward to making this soon. When you mention the cream, is this coconut cream? Yup it’s the best food in Philippines.. I miss it’s.. I miss all Philippines food… I wish I was there to eat pinakbet and guinataang kalabasa na may hipon or krab lol..
It’s more fun in the phil..
For us, we call it more of pumpkin then butternut. I hope you are not based in Christchurch, terrible disaster. Thanks for your thoughts, were all OK here. I am in Auckland, lets just hope and pray that people in Christchurch will all be fine. 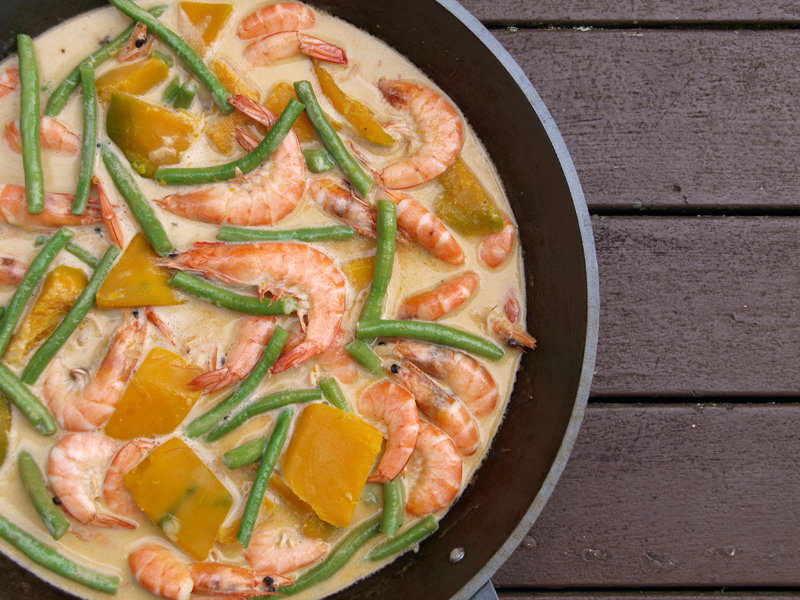 I think this is my favorite dish of yours of all time… butternut, shrimp, coconut cream, and green beans are all some of my favorites! Ja.. U r right.. I miss Philippines food here.. That is my favorite food and pinakbet I like so much.. I hope this year I come back to Phil..
You, my friend, come up with the most inventive, satisfying meals on your blog. I simply love it! Love this blog. So you know I am going to be trying this recipe out right? lol. I love your blog! Everything look delicious but easy to do! I`ll try them soon!